other information Green Linnet GLCD 1153, 1995. 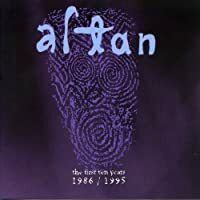 This is a compilation of selected tracks from Altan albums already covered in irishtune.info. For musician and instrument details per track, see those original albums. Tracks 3, 10, and 13 are from Altan, track 8 is from Horse with a Heart, tracks 4 and 6 are from Red Crow, tracks 1, 5, 12, and 15 are from Harvest Storm, and tracks 2, 7, 9, and 14 are from Island Angel. 20 members have this album.